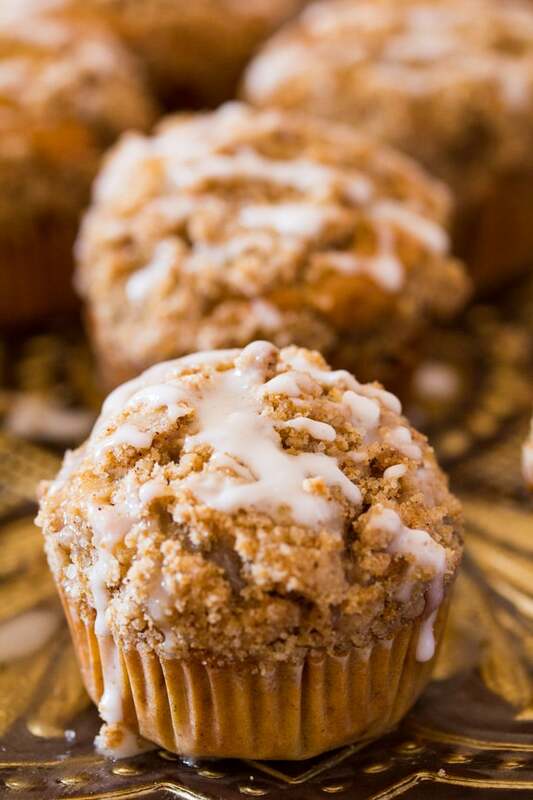 This Best Banana Muffins Recipe is packed with banana flavor and the brown sugar streusel (crumb) topping is divine. If you want to indulge a little more, don’t forget to drizzle them with the vanilla icing. Read on to find my tips on how to ripen bananas quickly and also how to store and freeze the best banana muffins! So I absolutely love bananas in baking. They tend to add the perfect sweet flavor and also moistness. And any baked banana good is usually healthy-ish so it’s kind of okay to have them as breakfast. Who doesn’t love dessert for breakfast? I know I do! And this Best Banana Muffins Recipe is the perfect way to start your day with. Not that this best banana muffins recipe would be considered super healthy, but I think since there’s fruit in the muffins let’s just agree that these banana muffins are kinda healthy. While this best banana muffins recipe is pretty simple (no creaming butter and sugar since we are using oil) I do have some tips for ensuring that you end up with the best banana muffins ever! We all know how important it is to use very ripe bananas in all baked banana goods / desserts. However if your family is like me and loves bananas, you usually don’t end up with any super ripe bananas. But you have a hankering for this best banana muffins recipe and no ripe bananas? Worry not! I’ve got a few of tips to quickly ripen the bananas. This is the quickest method to quickly ripen bananas. Poke a banana with a fork all over the peel and then place in the microwave for 30 seconds. Check and see if the banana has softened enough. If not continue for another 30 seconds to 1 minute. Preheat your oven to 300 F and line the bananas on a baking sheet. Bake for about 40 minutes. Now the bananas will be completely black, but worry not, they’ll be perfectly ripe inside and totally ready for this best banana muffins recipe. Even though this method is fairly quick, you have to use yellow bananas. You can’t use green bananas because they aren’t fully ripe for this method, so keep that in mind. This is a slower method than the two methods mentioned above but you can place bananas in a paper bag and loosely close it. After 12-24 hours the bananas will be ripe enough to be used in this best banana muffins recipe! *note these tips have been adapted from: 5 Genius Ways to Quickly Ripen Bananas. As discussed above, the riper the bananas the better they are for making the best banana muffins. I like to use almost brown bananas for baking because they impart the most flavor. However if you don’t have ripe bananas, just use one of the methods above to quickly ripen bananas. I like to use oil in these banana muffins for two reasons: oil makes these bananas super moist, and since the bananas have such a strong flavor using butter instead of oil isn’t all that important because we already get maximum flavor from the bananas. I like to use brown sugar in these best banana muffins because the brown sugar has a deeper flavor than white sugar and also it helps add moisture to the banana muffins. Nobody likes dry banana muffins. I like to use a hand whisk to mix this banana muffin batter because this way there’s less risk of over mixing the batter. Now, how do you know how much mixing is just the right amount of mixing? Well just stir the batter until you can no longer see white streaks of flour. Stop stirring after that, or else you’ll be at risk of over mixing the batter which can result in a tough texture of the banana muffins. These banana muffins can be stored at room temperature in an airtight container for 3-4 days. You can also freeze these banana muffins. After baking the banana muffins wait until they are at complete room temperature. Then wrap them with cling film, and place in ziplock bags and freeze. To thaw the banana muffins, place them out of the freezer at room temperature or gently microwave for a few seconds. PIN THIS BEST BANANA MUFFINS RECIPE HERE! Looking for more banana recipes? 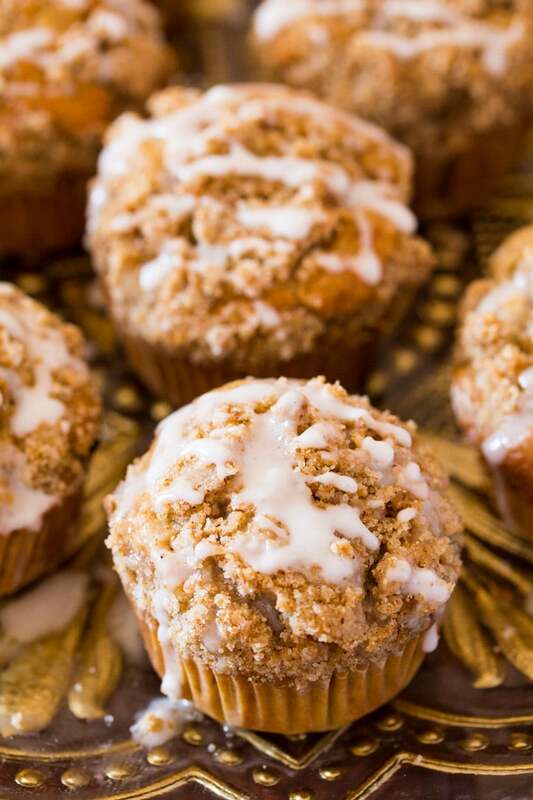 These easy to make Best Banana Muffins Recipe are topped with a crumb (streusel) topping and then drizzled with a delicious vanilla icing. Perfect for breakfast or a snack! Preheat oven to 375 F and prepare a 12 count cupcake pan by greasing it or line with 12 cupcake liners. In a large mixing bowl, combine the dry ingredients: all purpose flour, baking powder, baking soda, salt, and cinnamon. Whisk until combined. In another bowl, combine the wet ingredients: egg, brown sugar, vanilla extract, mashed bananas and oil. Transfer the wet ingredients to the dry ingredients mix and gently mix until fully incorporated. Do not overmix. Using a scoop or a tablespoon transfer the banana muffins batter to the prepared cupcake pan. In a small bowl combine the brown sugar, all purpose flour and cinnamon. Cut in the butter. Crumble this streusel topping over the muffin batter. Bake at 375 F for 20-25 minutes or until an inserted toothpick comes out clean. Combine the vanilla icing ingredients and mix well. Drizzle over prepared banana muffins. These banana muffins will keep well at room temperature in an airtight container for 3-4 days. I have always wanted to have a good banana muffin recipe. Your recipe really looks nice and easy to make at home. Need to make this muffins at home soon. Your banana muffins look absolutely wonderful. 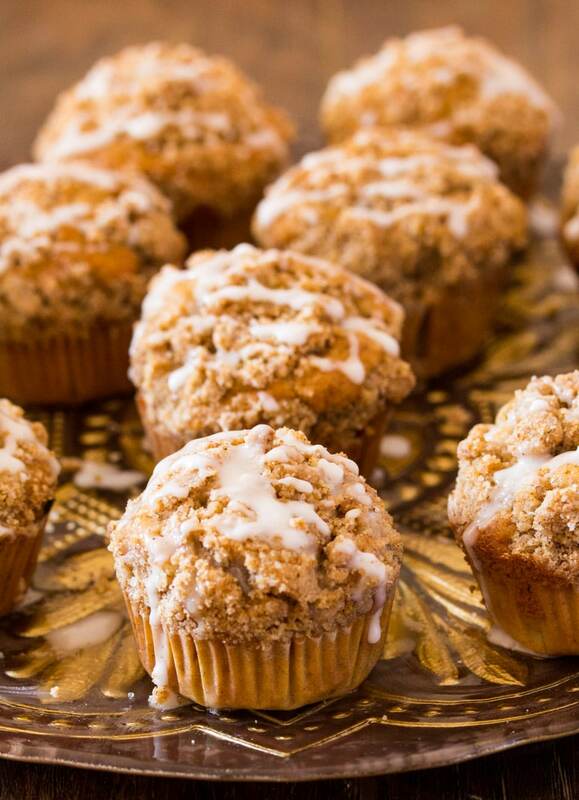 The streusel and drizzle are the perfect touch to this recipe. I swear that bananas clone themselves in our freezer. I love having banana muffin recipes so I can use those bananas up!! My favorite topping is a streusel topping. I’m pinning the recipe. 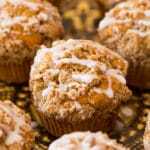 I love banana muffins and from your ingredients I agree that this is the best recipe ever, love the streusel topping. These banans muffins look incredible! I have been making banana muffins instead of bread for easy storing and less wastage. Love the recipe and absolutely love the streusel topping. 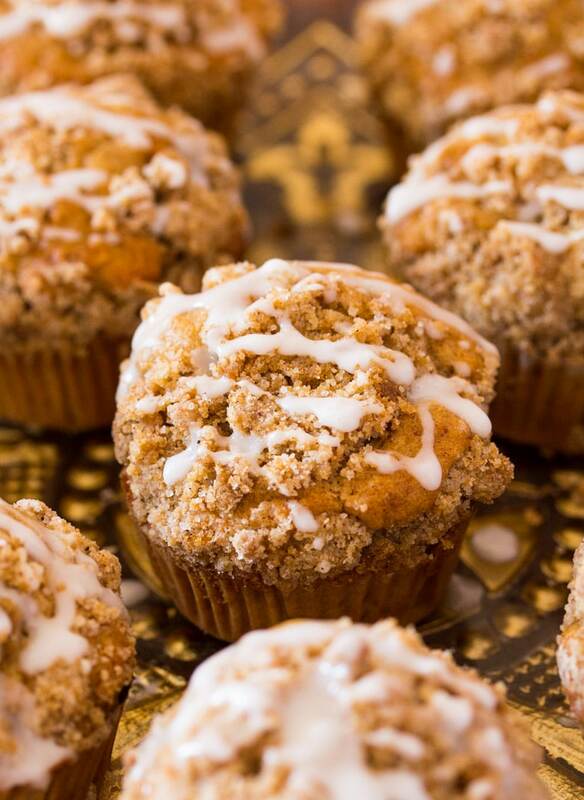 I love the streusel topping in all my muffins. To add to that this also has the vanilla icing. I LOVE banana bread, so I would definitely enjoy these muffins! Loving that crumb topping! As soon as I saw these on pinterest I just knew I had to make them!!! I had bananas in the fruit bowl that really weren’t fit for eating, so it was perfect timing. MAN!!! My kids, hubby and Father in law went crazy for them!!! They said they were unlike any banana muffins they had had before and so good!! I think it is the Streusel topping and the icing!!!! It makes these so different and so yummy. Banana bread is one of my favorites.. but never tried the banana muffins. And since I already have the perfectly browned bananas, this will be on my next lis of recipe to tackle. I love anything banana! The look fantastic! !